Step aside A-B-C! Now K-L-M is easier than 1-2-3! To welcome the arrival of spring, our K-L-M trio of delicious and easy-to-grow All-America Selections (AAS) award-winning vegetables are performing extra duty as showy ornamentals in a raised salad table. The salad table was built by the Pine Belt Master Gardeners and works great year-round for gardeners of all ages. 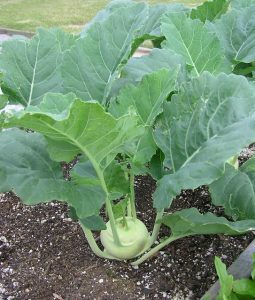 Kohlrabi Konan produces a bulbous stem that can be sliced or diced. This 2016 AAS winner can also be enjoyed up close for its out-­of-­this-­world look. 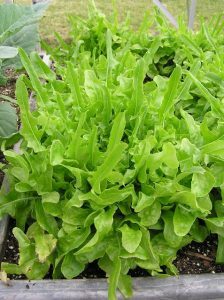 Sandy is a 2015 AAS winner with lots of tasty, oak-leaf-type leaves on attractive, uniform, mounded plants that are disease resistant and slow to bolt. 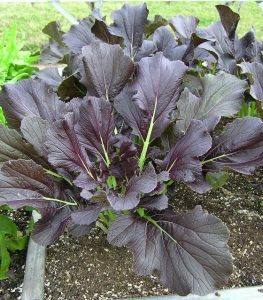 A 2016 AAS winner, mizuna (Japanese mustard) Red Kingdom has a mild flavor and provides a showy display with its dark-­colored leaves. The aim of HighLights newsletter is to keep nursery and landscape professionals, extension and research personnel, Master Gardeners, horticultural suppliers, and home gardeners up-to-date on news from the Trial Gardens and horticultural research at the South Mississippi Branch Experiment Station in Poplarville. The HighLights archive can be found here.